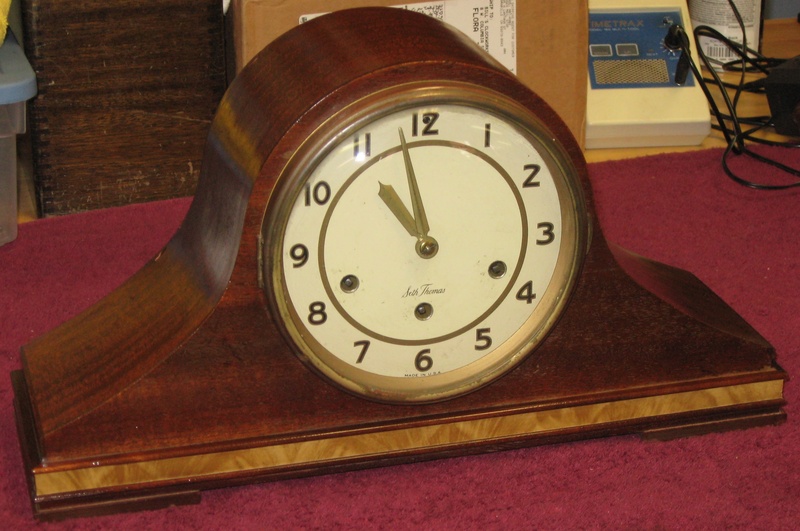 This Seth Thomas Westminster chime mantel clock has a No. 124 movement. 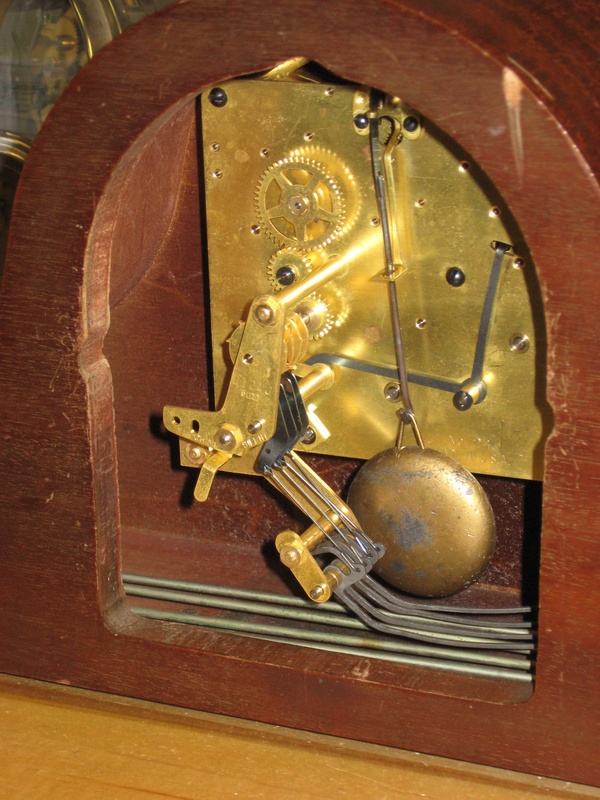 The cover on the back of the clock says “KENBURY-1W MODEL No. E- 705-003”. The case is mahogany with a lighter wood inlay band across the bottom. 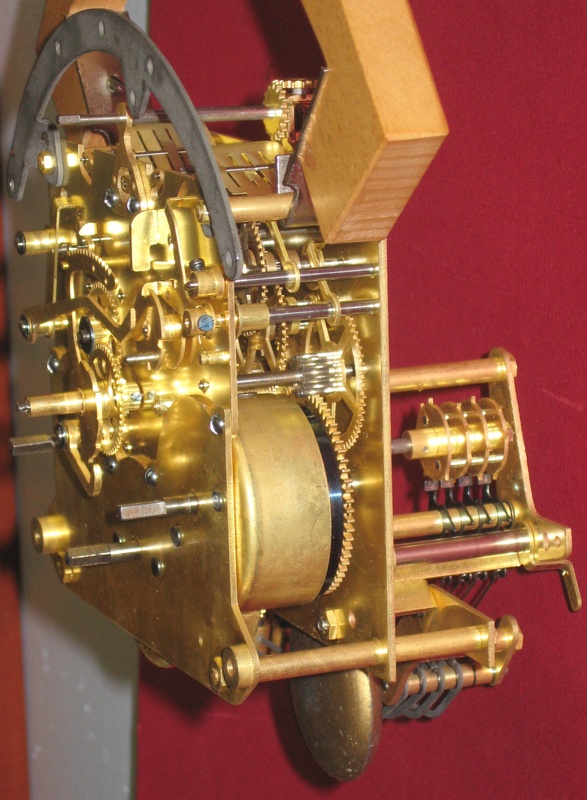 The 1951 Seth Thomas catalog shows this clock. Height 8 3/8 inches, width 15 3/8 inches, minute hand length 2 3/8 inches. The No. 124 movement in this clock has the date code 5011 (November 1950) and the bottom of the case has the date code 5102 (February 1951). Repair job 6682. This clock needed a lot of work. When I received it, the time and chime mainsprings had been swapped. The two spacers for the mainspring barrel plate were missing. several screws were missing. The teeth on the time mainwheel were damaged. I polished the pivots and installed 34 bushings! The sleeve that supports the chime shutoff lever was missing. The No. 124 movement is an excellent runner, but will need overhauling when it stops working after years of use. Yes, I’m sure the clock is authentic. I purchased this exact mantle clock in hermiston oregon. Wonderful sound and very well maintained. My brother didn’t want my moms Seth Thomas Clock with key, he was going to toss it out!!! My parents converted it over to Electric Many years ago, when they both where alive. It still runs, it’s just the outside wood shell is bad, needs to be redone, I’m wondering how I go about? I was thinking I could lightly sand it, then paint it. I just don’t know if that would be the right way. Don’t know what kind of paint to use. If you could give any suggestions that would greatly appreciated!! !